The CHIME Healthcare IT Leadership Academy provides personalized, onsite professional education to firms’ executive leadership using success factors developed by healthcare’s top CIOs. Taught by an experienced team of CHIME faculty members, the immersive sessions focus on the management and leadership skills and strategies needed to excel in today’s competitive health IT industry. CHIME faculty will share the keys to success, offering insights gained from years of experience as change leaders in their organizations – all conveniently done at your preferred location. 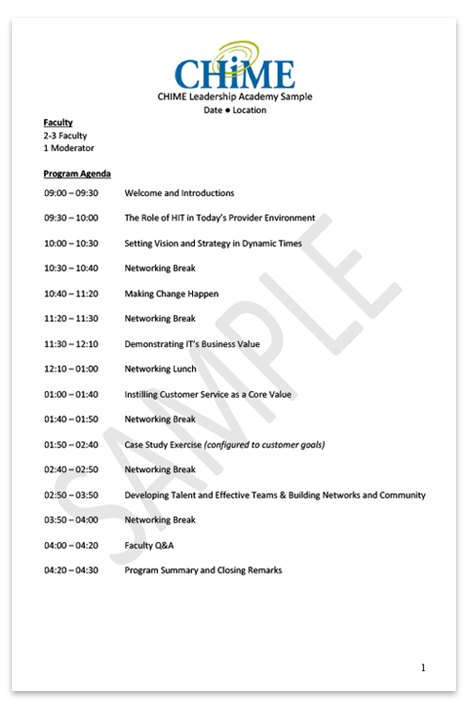 View the sample agenda for the CHIME Healthcare IT Leadership Academy. As a relatively new member to CHIME, I was not sure what to expect from their programs. What I found is a community of peers and mentors who are committed to helping each other grow. It’s not about the technology, it’s about the people. CHIME has let me focus on my strengths and weaknesses, reflect and learn new approaches to change management, collaboration and communication. Time spent with faculty was refreshing and an opportunity for candid feedback. To be a strong leader, self-awareness is critical. My experience with CHIME education was my “reset button”; an opportunity I used to realign my professional goals and work priorities while remaining family-centric. 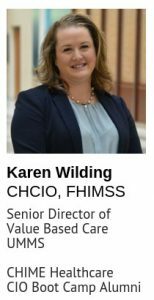 The changing healthcare environment demands a dynamic leader to build cross-functional teams, ready to invest in others. I encourage leaders to attend and make this an important stop along their journey. Please fill out the form below, as completely as possible.